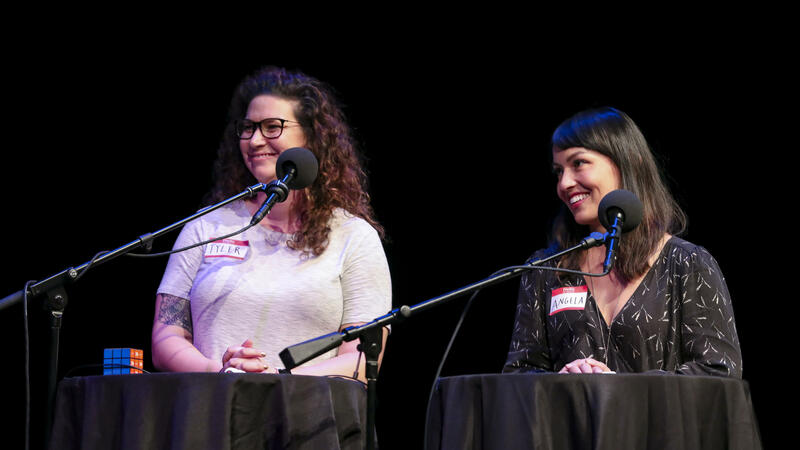 Contestants go head-to-head in the Final Round on Ask Me Another at the Balboa Theatre in San Diego, California. In this final round, every answer includes a word for a family member or relative. It's time to crown our big winner. Let's bring back our finalist, Tyler Parthemer, who enjoys The Game of Life because unlike real life, it gives you the chance to buy a house. EISENBERG: And Angela Estes, who baked a wedding cake that looked like an overhead projector. EISENBERG: Tyler, Angela, in honor of the holidays, your final round is called Family Gathering. Every answer will include a word for a family member or relative. Our big winner will receive an ASK ME ANOTHER Rubik's Cube signed by Adam Lambert and Tony Hawk. We spun a dreidel backstage, and Tyler got Gimel, so she's going first. EISENBERG: Tyler, this time-keeping device also known as a long case can be 7 1/2 feet tall and has a pendulum inside. EISENBERG: Angela, this tart, green fruit is named after the woman who originally cultivated it in Australia. It's often baked into pies. EISENBERG: We're looking for Granny Smith apples. Tyler, this term refers to the location of a computer's central processing unit. EISENBERG: I'm sorry. That is incorrect. We were looking for motherboard. Angela, this '90s sitcom starring Tia and Tamera Mowry was about two twins separated at birth and reunited 14 years later. EISENBERG: Tyler, Julianna Margulies starred in the CBS drama that ran from 2009 to 2016. EISENBERG: Angela, these lengthy-limbed arachnids are also known as cellar spiders or harvestmen. EISENBERG: Tyler, a 1961 congressional resolution honored a meatpacker from Troy, N.Y., as the inspiration for this patriotic character, though the legend is disputed. But he wants you for the U.S. Army. EISENBERG: Angela, go to the mall, and you might be accosted by pretzel smells wafting from this business, named for the woman who co-founded it in Pennsylvania. EISENBERG: I'm sorry. That is incorrect. It's Auntie Anne's. We're at the halfway point. Tyler is in the lead, 3 to 2. Tyler, it's the sixth book published in "The Chronicles Of Narnia" series, but its stories takes place first chronologically. EISENBERG: We're looking for "The Magician's Nephew." EISENBERG: Angela, Will Ferrell and John C. Reilly star in this 2008 movie about middle-aged men who become roommates when their parents get married. EISENBERG: Tyler, this John Mayer song warns fathers that girls become lovers who turn into mothers. EISENBERG: Angela, in this 2015 single, Meghan Trainor lays down the rules for her hypothetical spouse. ESTES: "Mama Says Something" (ph)? EISENBERG: Good guess. (Laughter) We were looking for "Dear Future Husband." Tyler, Minneapolis and St. Paul are collectively known as this. EISENBERG: OK, here's the situation. Tyler is in the lead, 5 to 3. Angela, if you get this question wrong, Tyler wins. Angela, Mount Holyoke, Vassar, Wellesley, Smith, Radcliffe, Bryn Mawr and Barnard are collectively known as these colleges. EISENBERG: The score is 5 to 4. Tyler, if you get this right, you win. Tyler, "California Dreamin'" and "Monday, Monday" are two of this music group's biggest hits. PARTHEMER: The Mamas & the Papas. EISENBERG: Great game. Great final round. Angela, amazing. Thank you. And congratulations, Tyler. That's our show. ASK ME ANOTHER'S house musician is Jonathan Coulton. EISENBERG: Our puzzles were written by Camilla Franklin, James Greenberg (ph), Ruth Morrison (ph) and senior writer Karen Lurie with additional material by Cara Weinberger. Our senior supervising producer is Rachel Neil (ph). ASK ME ANOTHER is produced by Mike Katzif, Travis Larchuk, Kiara Powell, Edward Wyckoff Williams, Rommel Wood and our intern Alexis Stroemer, along with Steve Nelson and Anya Grundmann. We are recorded by Bill Moss and ValveTone Recordings. We'd like to thank San Diego and the Balboa Theatre. EISENBERG: And our production partner, WNYC. I'm Her Ripe Begonias.